Karin Slaughter’s novels featuring detective Will Trent are utterly riveting and masterfully drawn. 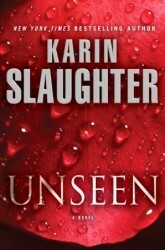 Her latest thriller, Unseen, pits detectives, lovers, and enemies against one another in an unforgettable standoff between righteous courage and deepest evil. "You're the first person in my life who's ever really seen me." Unseen takes us back to Sara's past. Lena Adams reenters the picture with a big bang! These two women have never liked each other and with a good reason. Sara still holds Lena responsible for the events occurring in Beyond Reach. Lena lives in Macon. She's now married to Jared Long, Jeffrey's son. She's doing great at her job and she's the lead in a new investigation. She's working with a snitch before taking down a big fish when everything goes wrong. This prompts an investigation by Internal Affairs. Then, Jared gets guned down at their home and is fighting for his life. Nell, Jared's mom calls Sara for support. Sara is furious with Lena because once again someone's life is in danger because of her. As for Will, he goes undercover as Bill Black to Macon, Georgia. He's in the middle of the case gone wrong and his life is very much in danger too. I felt bad for Will. He was in a tough spot. He was undercover and had to hide things from Sara. He knew this could lead to him losing her. After all, she had already lost someone when placed in a dangerous situation by Lena. Yet, he couldn't walk away either. "You can tell me to go, but I won't. I'll sleep in my car outside your house. I'll follow you to work. To the gym. If you go out to dinner, I'll be at the next table. If you go to a movie, I'll be in the row behind you." As always, Sara was great in Unseen. She was there for Will when he needed it the most. She supported Jared's family. She helped whoever needed it. Yes, she was mean to Lena once but then Lena returned the favor in spades. Ugh Lena, can you keep your mouth shut for one second? It's like she's incapable of behaving. I mean the woman has improved. She's a good detective or at least her team thinks so. She's trying to work things out with Jared, her husband. She's trying to follow her superior's commands but she's unable to behave in front of Sara. Twice she was awful to her, once with her words and once with her thoughts. I think she just envies Sara too much. Anyway, that's my two cents about Lena. I'm sure we haven't seen the end of her in this series. Overall, I think Unseen is yet another great addition to the Will Trent series.